UK haulage companies are calling on the French government to send in the army to protect lorries traveling through the port of Calais. The demands come after around 150 migrants broke into the terminal, with some 50 boarding a British ferry on Saturday. The demands were made by Richard Burnett, the chief executive of the Road Haulage Association, who wants the French authorities to take action to protect truck drivers. He told the BBC it was "only a matter of time before our worst fears become a reality and a UK-bound truck driver is killed." "This shocking breach of security clearly shows that the migrant mayhem in and around Calais is not being tackled," he added. "It is now time for the authorities to acknowledge and meet our demand for the French military to be deployed to secure the port and its approaches." On Saturday, the port of Calais in the north of France was temporarily closed after around 50 migrants boarded a British ferry. Police tried to restore order and some 24 people involved in the disturbances were arrested. 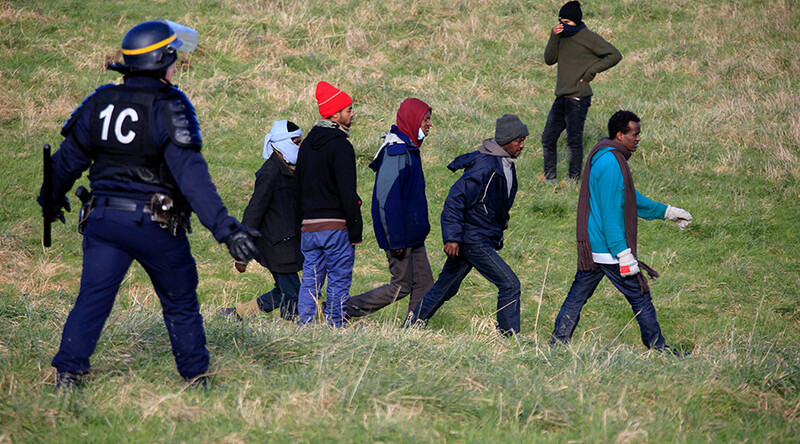 “A demonstration in Calais has drawn around 2,000 people and in the end around 200 people entered the port, with approximately 50 of them boarding a ferry, the 'Spirit of Britain', on an external deck,” deputy Calais prefect Denis Gaudin told Reuters. "If that requires deploying the military, then the French should do that," he added. 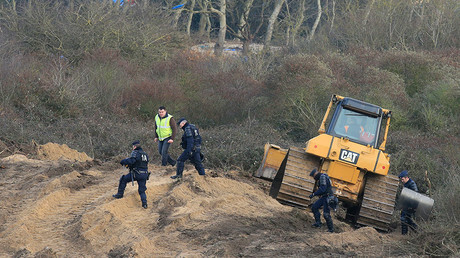 Earlier in the week, diggers and bulldozers protected by riot police began to clear a path towards the Calais ‘Jungle’ camp, which has become home to thousands of refugees who are looking to try and enter the UK. The French authorities want to create a 100-meter buffer zone between the Calais camp and the bordering motorway to protect thousands of lorries from migrant attacks, as the refugees try to board trucks headed to the UK. The authorities had given the Calais Jungle residents until January 14 to leave the area, but extended the grace period until January 18. Ahead of the clean-up effort, many of those living in the Jungle had already moved into 125 homes formed from converted shipping containers in an area adjacent to the camp. A rally by pro-refugee groups was held on Saturday by French groups on the left of the political spectrum, which saw around 2,000 people attend. The activists carried banners reading “refugees welcome here” and said that an increased security presence in the Calais region is a threat to migrants’ lives. However, many locals say they were “really frustrated” to see a crowd of activists and migrants walk through their neighborhoods, photojournalist Frederik Sadones told RT. While police were “all around” the place, they did not intervene until tensions showed signs of boiling over. “When the refugees were passing through the city center there were all kinds of reactions … when they were passing a certain house there was a man shouting at them, and they did not like this. So some sort of confrontation occurred,” Sadones said.